Vitamin D - Part I - What is it? Why is there a deficiency? How to use it. The Zen Haus ADK Supplement is a crafted multi-vitamin that is formulated to take advantage of the many synergistic benefits of combining certain key nutrients. However it is the sunshine vitamin, Vitamin D (Vit-D), that is the star of the show as it has the widest range of benefits and is supported by extensive research. The effect of Vit-D on fetal modifications of gene expression and regulation could explain why it has such wide-ranging health benefits at all stages of life. Vit-D receptors are present in most tissues and cells in the body. Much of the research has been on larger systems in the body, like the immune system, cardiovascular function and cell function. Emerging research continues in more specific areas and there is now research which investigates links to cancer. 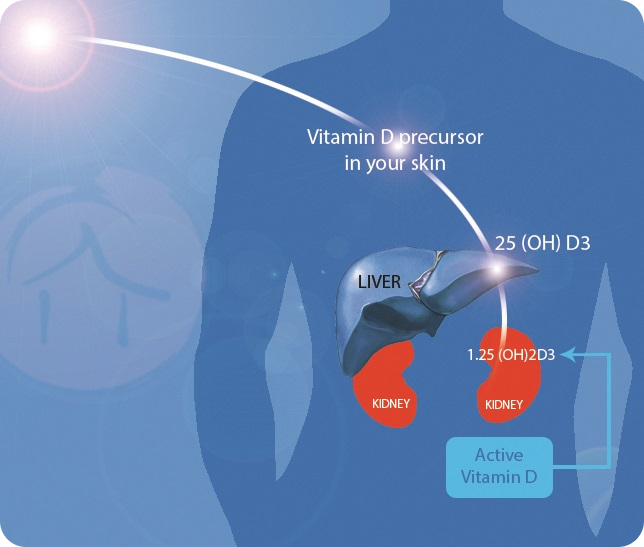 Part I of the post will discuss what Vit-D is, why we are deficient and supplementing with Vit-D. Part II and Part III will highlight some of the benefits of Vit-D along with supporting research. In this post Vit-D will be used for Vitamin D and may refer to any form of Vitamin D including the active form. D3 will refer to Vitamin D3 (cholecalciferol) and D2 will refer to Vitamin D2 (ergocalciferol). UV-B will refer to Ultraviolet B radiation. The generally accepted measure of Vit-D status is circulating 25(OH)D concentration and this is what we are referring to when we talk about Vit-D serum levels. There are other measures available however that is out of scope for this article. We have quite a bit of history with Vit-D. It has been produced by phytoplankton for more than 500 million years and is thought to be the oldest of all hormones. Vit-D is a fat-soluble nutrient that is one of the 24 micro-nutrients critical for human survival. It interacts with the vast majority of the body’s cells. Nearly every cell and tissue in our body has Vit-D receptors. The Vit-D receptor is now known to be present in over 35 tissues. The active form of Vit-D is an enzyme that is present in a variety of sites including skin, bone, brain, pituitary gland, lymph, vascular muscle, heart muscle, ovarian, colon and white blood cells.1 It is no surprise then that Vit-D has such a wide-range of effects in the body. The sun is the major natural source of Vit-D and so it is also known as the ‘sunshine vitamin’. The Ultraviolet-B (UV-B) radiation from sunlight is required to produce Vit-D in the skin. UV-B rays from the sun penetrate the skin and convert cholesterol to pre-D3 and eventually becomes D3. D3, a fat-soluble nutrient, is converted into a water-soluble compound [25(OH)D3]. This water-soluble compound can then be converted in the kidneys to the active form of Vit-D which is a hormone. Experts agree that Vit-D deficiency is common among Americans. The American Endocrine Society and the Vit-D Council recommend having serum Vit-D levels above 30 ng/ml and considers having less than 20 ng/ml to be deficient. The Institute of Medicine recommends having at least 20 ng/ml.2 In the United States, approximately 70% of the population has Vit-D levels below 30 ng/ml. In northern latitude locations, up to 73% of the population may have levels of less than 20 ng/mL during winter.3 In other words, most Americans are Vit-D deficient. Vit-D excess, however, is rarely seen in the general human population. Why is there a deficiency? To start the process we need exposure to sunlight and this can be limited due to cloud cover and modern lifestyle. Cloud Cover. Some locations have more cloud cover due to seasonal factors. This will usually be in line with the amount of rainfall. A place like Seattle and surrounding areas will have much cloud cover in the winter months. Residents will have much less exposure to sunlight. Modern Lifestyle. Throughout most of our evolution we spent a great deal of time outdoors. In modern times however, most of us are required to be indoors for work during the daytime when the best sunlight is available. Workers spend most of the daylight hours working indoors in corporate and home offices, stores and malls, factories and plants and so on. We should take advantage of any opportunities, like breaks, lunch or work-related trips, to get outside for the prime sunlight. In terms of Vit-D production, the time of day, time of year and altitude determine the quality of sunlight received. Time of Day. Sunlight is most direct closer to midday. When we expose our skin to sunlight at this time more Vit-D is produced. Altitude. We can produce more Vit-D from sunlight exposure when we are higher up. All else being equal the sun is more intense on top of a mountain than at the beach. This seems intuitive as we will be closer to the source. Also, the air tends to be cleaner at higher altitudes which means less UV-B blocking. Vit-D production is reduced by anything that decreases the intensity of the sun’s rays. In addition to the earth’s atmosphere and cloud cover, elements on the surface such as air pollution and smog, glass windows, clothing, and sunscreen can block and filter out the UV-B rays required for making Vit-D. Even when we assume that the UV-B rays from the sunlight makes it past all of the potential barriers noted above, there still remains additional barriers such as inadequate cholesterol levels, skin color as a biological filter, and age-related synthesis issues which have the potential to limit Vit-D production in the body. Low Cholesterol Diet. We need cholesterol in our system in order to produce Vit-D. During exposure to sunlight, 7-dehydrocholesterol in the skin is converted to pre-vitamin D3. Cholesterol has been warned against in the west and generally avoided. This may have reduced our ability to produce Vit-D.
Age. The efficiency of conversion to Vit-D tends to decrease with age.10<="" span=""> A seventy-year-old makes about four times less D3 from the sun than a twenty-year old. Older men and women who fail to get enough Vit-D have a higher risk of muscle weakness and poor physical performance. Sunscreen, protective clothing and time spent indoors already keep most older Americans from getting enough Vit-D from exposure to UV-B rays from sunlight. Body fat absorbs and holds Vit-D making less of it available for use in the body. Obese children and adults are said to require 2 to 5 times more Vit-D to treat and prevent deficiency. With so many potential barriers we can appreciate why Vit-D deficiency is so common despite our body’s natural ability to produce it from sunlight and cholesterol. Human migration and its evolutionary by-products in addition to modern issues like air pollution and lifestyle changes have greatly limited our exposure to the sunlight needed for natural Vit-D production. Even good sun exposure does not guarantee adequate blood levels of Vit-D. Many individuals can still have low Vit-D serum levels despite abundant exposure to sunlight because of skin color, age, body fat and diet. Though we are always adapting to the changing environments we may need to supplementing with Vit-D to stay healthy. Perhaps, it is how we should be adapting to these changes. The half-life of Vit-D in the liver is about 3 weeks. Frequent replenishment is required to maintain adequate serum levels. Supplementing with Vit-D is associated with a wide range of benefits, including increased cognition, immune health, bone health and general well-being. Whether we get it from sunlight or supplements or both, Vit-D plays a critical role in overall health. Those who choose to supplement with Vit-D will want to consider which form to use, what are the range of appropriate doses, and how to incorporate it into the diet for the most benefits. The form we consume in food, supplements and indirectly from the sunlight is D3 or cholecalciferol. This is the naturally-occurring form of Vit-D synthesized in humans. Our body converts this into an active form which is the steroid hormone calcitriol. In the active form, it travels throughout the body and plays a part in a number of diverse and vital functions. It helps to make enzymes and proteins that prevent diseases, builds bones and muscles and also has anti-inflammatory effects. With so many variables it is difficult to study the long-term effects of receiving various levels of Vit-D. Numerous factors such as age, location, sunlight available in a given year, sunlight exposure to in a given year, quality of sunlight and UV-B levels in a location, sunlight blocking and filtering, skin color, ability to produce from sunlight, ability to absorb from supplements, Vit-D receptor issues and so on make it difficult to work out any conclusions. The Grassroots Health organization recommends 2,000 IU to help get us to the 40-60 ng/ml range. The 60 level offers the most overall health protection as recommended by their scientist panel. Vit-D intakes of 1000-2000 IU are needed to reach and maintain serum levels greater than 30 ng/mL. Some doctors and researchers recommend taking around 600-800 IU per day. Prominent researchers like Michael Holick and Reinhold Veith are now suggesting that up to 10,000 I.U. is a safe daily dose. Lifeguards, farmers and sailors and others who work outside and who are out in the sun all day can make 10,000 IU of Vit-D. It is best to take Vit-D with a meal and preferably with fats like coconut oil or fish oil. It is also good to have with butter, eggs and cheese. Vit-D is a fat-soluble nutrient that interacts with the vast majority of the body’s cells. Despite the sun being the major natural source of Vit-D, experts agree that Vit-D deficiency is common among Americans. The amount of sunlight exposure, quality of sunlight, sun blocking and filtering agents, biological ability to produce Vit-D and body fat dilution all contribute to Vit-D deficiency. D3 is recommended over D2 because D3 is used more effectively in the body. 2,000 to 10,000 IU of Vit-D per day is recommended to raise and maintain healthy serum levels. In Part II we begin to look at the ongoing research on the many associated benefits of Vit-D supplementation. posts subscribe to our mailing list. © Marc Montrichard for MyZenHaus.Com, 2018. Unauthorized use and/or duplication of this material without express and written permission from this site’s author and/or owner is strictly prohibited. Excerpts and links may be used, provided that full and clear credit is given to Marc Montrichard and MyZenHaus.Com with appropriate and specific direction to the original content.